This highly recommended book, written by Fr. Quentin Hakenewerth, is a spiritual journey based upon the Marianist method of virtues by Bl. William Chaminade. The method followed in this book is a spiritual journey of being changed gradually by taking on certain attitudes and habits of Jesus Christ. The process leads you to a new awareness of yourself, of others, and of God. It helps you to develop certain capacities of your personality, which perhaps you are not using fully or which are being blocked by some unattended attitude. This journey is not just an imitation of His good qualities; it is a personal union with Him. In that union our small efforts and His boundless grace work together to fashion our true selves. 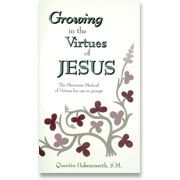 To guide your student in "The Virtue Tree" course by Sandra Garant (found within CHC Lesson Plans for Seventh Grade), it is highly recommended that you read the corresponding chapter in Growing in the Virtues of Jesus before assigning a lesson in "The Virtue Tree."